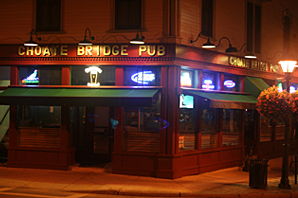 Located in historic downtown Ipswich, MA, we offer delicious food in a comfortable, friendly environment. Our menu includes such favorites as fresh seafood, pizza, grilled steaks, burgers and salads. In addition, we have a wide variety of beers on tap. Most importantly, you’ll always find a great group of people, from local regulars to international tourists, mingling together at the bar. Stop by and give us a try. We look forward to serving you.